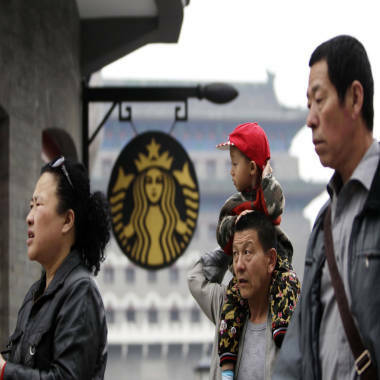 People walk past a Starbucks coffee store at Qianmen Commercial Street in central Beijing, in this file picture. BEIJING – Starbucks is the latest foreign company to draw fire from China’s state media due to its high prices. The government-controlled TV broadcaster, China Central Television (CCTV), accused Starbucks of unfairly setting higher prices in China than in other markets, discriminating against Chinese consumers. CCTV ran a 23-minute segment on the price of Starbucks coffee during its hour-long news program on Sunday. In the report, CCTV said the price of a tall latte in Beijing is 27 yuan or $4.43. That’s higher than in London, Chicago or Mumbai, where the same drink costs $4.00, $3.26 and $2.40 respectively. “Each Starbucks market is unique and has different operating costs, so it would be inaccurate to draw conclusions about one market based on the prices in a different market,” Christina McPherson, a Starbucks China spokesperson, said in response to questions about the cost disparity by NBC News. Some experts say that the CCTV report has to do with China’s recent crackdown on pricing. While the campaign has not exclusively targeted foreign companies, many, including Apple and a number of major milk powder producers and luxury goods brands, have found themselves in the state media’s crosshairs. Shaun Rein, the founder and managing director of Chinese Market Research Group, a strategic market intelligence firm in China, told NBC News that the motivation behind CCTV’s report is to protect Chinese brands and domestic consumers – but it chose the wrong company and wrong product this time around. Rein also cited taxes, employee training and logistics in China as key costs that drive up the price of coffee in chains like Starbucks. CCTV’s report on Starbucks has caused an Internet sensation. Sina Weibo alone had over 4 million posts on the subject by Tuesday afternoon – most of them criticizing CCTV for going after Starbucks. And hash tags like “I’m at Starbucks” or “I’m on the way to Starbucks,” were in heavy use on Weibo on Tuesday.